This aerial photo was taken from a helicopter at the tongue of the Juneau Icefield Glacier. It was one of the most impressive helicoter tours we have taken. The Glacier at the Icefield seems to be endless. This picture shows some "fresh blue ice" which has broken off just a few hours before. helicopter tours are leaving from Juneau on a daily base staring in spring. 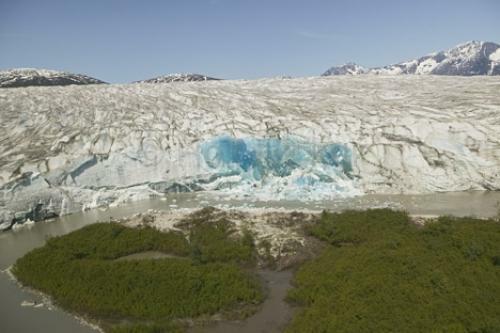 Aerial photo of fresh blue ice at the Juneau Icefield Glacier near Juneau, Alaska.